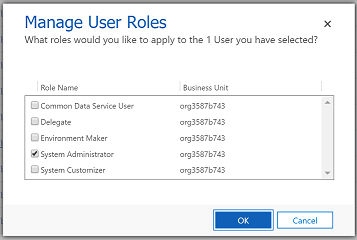 Add or remove a user or group from either the Environment Admin or Environment Maker role. Provision a Common Data Service database for the environment. Set Data Loss Prevention policies. Set database security policies (as open or restricted by database roles). Members of the Azure AD tenant Global administrator role (includes Office 365 Global admins) can also manage all environments that have been created in their tenant and set tenant-wide policies. For more information, see Environments overview. Go to powerapps.com, and then select the gear icon in the navigation header. The Global Administrator role of your Azure AD or Office 365 tenant. You also need either a PowerApps Plan 2 or Microsoft Flow Plan 2 license to access the admin center. For more information, see the PowerApps pricing page. Any changes that you make in PowerApps Admin center affect the Microsoft Flow admin center and vice versa. For instructions on how to create an environment, see Create an environment. If you are a member of the Global Administrator role of your Azure AD or Office 365 tenant, all the environments that have been created by users in your tenant appear, because you're automatically an Environment Admin for all of them. Open the PowerApps Admin center, find the environment to be renamed in the list, and click or tap it. in the Name text box, enter the new name, then click Save. If you have created the database in the environment, then you will not see this option. You can rename the environment from Dynamics 365 Admin center by clicking on the link in Details tab. In the PowerApps Admin center, click or tap the environment that you want to delete. Click or tap Delete environment to delete your environment. If an environment doesn't already have a database, an Environment Admin can create one in the PowerApps Admin center by following these steps. Only users with a PowerApps Plan 2 license can create Common Data Service databases. Select an environment in the environments table. After you create a database, choose a security model. For more information, see Configure database security. Add or remove a user from either the Environment Admin or Environment Maker role. View and manage all resources created within an environment. If the environment has the database, then you need to assign users the System Administrator role, instead of the Environment Admin role. The Environment Maker role can create resources within an environment including apps, connections, custom connectors, gateways, and flows using Microsoft Flow. Environment Makers can also distribute the apps they build in an environment to other users in your organization. They can share the app with individual users, security groups, or all users in the organization. For more information, see Share an app in PowerApps. Select the environment in environments table. a. Select either the Environment Admin or Environment Maker role. b. Specify the names of one or more users or security groups in Azure Active Directory, or specify that you want to add your entire organization. c. Select Save to update the assignments to the environment role. a. Add the user to the environment and click on the link to assign the user a role. b. Select the user from the list of users in the environment / instance. c. Assign the role to the user. d. Select OK to update the assignments to the environment role. The ability to create and modify a database schema and to connect to the data stored within a database that is provisioned in your environment is controlled by the database's user roles and permission sets. You can manage the user roles and permission sets for your environment's database from the User roles and Permission sets section of the Security tab. For more information, see Configure database security. An organization's data must be protected so that it isn't shared with audiences that should not have access to it. To protect this data, you can create and enforce policies that define which consumer services and connector-specific business data can be shared with. Policies that define how data can be shared are referred to as data loss prevention (DLP) policies. You can manage the DLP policies for your environments from the Data Policies section of the PowerApps Admin center. For more information, see Data loss prevention policies. How many environments and databases can I create? You can create up to two Trial environments and two Production environments, depending on their license. Read here for more details. Each user can provision databases in two Trial environments and two Production environments, depending on their license. Which license includes Common Data Service? PowerApps Plan 2. See PowerApps pricing page for details on all the plans that include this license. While trying to create a new environment, I am getting an error. How should I resolve it? You have already utilized your quota to create a specific type of environments. Say you were creating a Trial environment and you get this error message. That means, that you have already provisioned two Trial environments. You can view all the environments in PowerApps Admin center. If you want, you can delete an existing environment of that specific type and create a new one. But, please make sure that you don't lose your data, apps, flows and other resources which you want to retain. You do not have a quota to create that specific type of the environment. Check what type of environment you can create here. If you are getting any other error message or have more questions, please connect with us here. When will my Trial environment expire? Trial environment expires after 30 days of its creation. If you don't want your environment to expire, there will be ways to convert it into a Production environment. This functionality, will be coming soon and we will not expire Trial environments till then. Does my current database (created with previous version of the Common Data Service) also gets counted in the quota? If you had a database (created with previous version of the Common Data Service), they will also get counted with your Production environment quota. If you now create a database in an environment (created prior to March 15, 2018) then it will also get counted as Production environment. Can I rename an environment? Yes, this functionality is available from the PowerApps Admin center. See Environments Administration for more details. Can I delete an environment? Yes, this functionality is available from the PowerApps Admin center. See Environments Administration for more details. 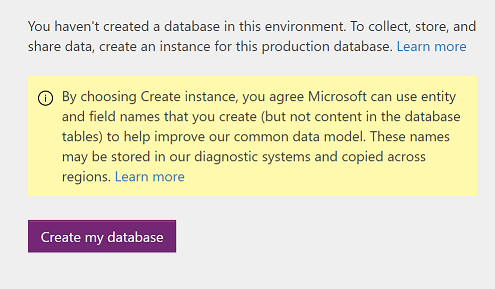 Please note that you currently can't delete a Production environment with a database (with latest version of the Common Data Service). This will be coming soon! As an Environment Admin, can I view and manage all resources (apps, flows, APIs, etc.) for an environment? Yes, the ability to view the apps and flows for an environment is available from the PowerApps Admin center. See View Apps for more details.